We have made several balloon flights here at the salon, sailing high above Europe in the company of some aviation pioneers of the glorious Georgian age and today we return to the clouds for a fateful, unhappy day in the history of ballooning. 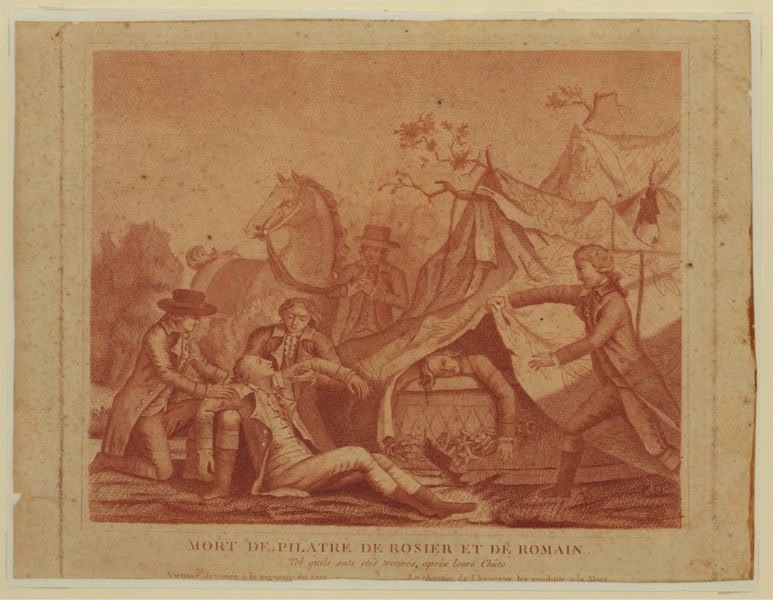 Jean-François Pilâtre de Rozier was a teacher and ballooning enthusiast who had achieved fame when he made the first manned free balloon flight in 1783. Riding high on this success, his next plan was even more audacious: a cross-Channel flight. A new balloon powered by hot air and hydrogen was required and after test flights throughout 1784, de Rozier was ready to take to the skies once more. Well aware that this was a risky venture, De Rozier grew more anxious as the day approached but was grateful for the presence of Pierre-Jules Romain, his experienced co-pilot. Early on 15th June 1785, the pair lifted off from Boulogne-sur-Mer in a richly decorated balloon, hoping for fair winds, good weather and a trouble-free flight. Unfavourable winds forced them further and further from the coast and modern investigations have concluded that a static spark ignited the heavily gilded hydrogen bag, causing the balloon to deflate. It crashed down to earth in a cloud of flame before eyewitnesses including de Rozier's young fiancée, Susan Dyer, just half an hour after its ascent. Both passengers in the balloon were killed and France was plunged into mourning for these first, high profile ballooning fatalities. A week later Dyer was found dead after apparently taking her own life and the men were memorialised throughout the nation, with an obelisk marking the spot at which they died.